will reward you every day with a powerful feeling of personal accomplishment. and helps prepare you for a new career in a fast-growing field like High-Tech Electronics, IT Security or PC Repair. Special offer to new students! 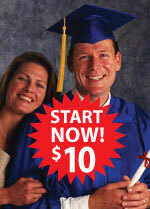 Enroll in any program with $5 down and get $400 in saving rebates that can apply towards tuition or textbooks. Plus, every new student gets a FREE CIE embroidered cap after completing ten lessons! We make it easy to get started. Now, more than ever, it's easier to make an educated decision on your future. Enroll now at an affordable rate which will be locked in for the remainder of your program. Simply enroll before July 31st and you're eligible for $400 in rebates that you can use towards future monthly tuition payments or textbook purchases. The rebate schedule is based on your enrollment date and includes four separate $100 rebates. Get a free CIE embroidered cap after you complete ten lessons! For over 80 years CIE has helped students from around the world reach their goals via distance education. A CIE education will reward you every day with a powerful feeling of achievement the rest of your life. instructor support, on-line exams, hands-on labs, an interactive instructor-led chat room and a textbook buyback program. advance in your current job! Instructor Chat Room - Simply log on and ask a questions right from your computer. Video Library - Watch an instructor discuss a variety of lessons and hands-on labs. On-Line Exams - Take your exams online on our eGrade web site anytime you want. Hands-on Labs - Train on your own lab equipment and practice as often as you need. Getting started is so simple. Just fill out the online enrollment agreement or call an Admissions Advisor at (800) 243-6446. These programs were designed with you in mind. They're a smart value and have prestigious benefits that will last a lifetime! Don't let this opportunity slip by you, enroll today.